Beginning Latin. This course presumes no knowledge of the language and introduces the student to authentic Latin literature with a clear presentation of how human thought is expressed in Latin. Classes are held both weekly during the academic term and daily during the summer programme (read more here) (register here). Intermediate Latin. This course presumes a familiarity with the verb in all times of the indicative and introduces the student to the principles and use of the subjunctive in real Latin literature, along with the natural meaning of participles. Classes are held both weekly during the academic term and daily during the summer programme (read more here) (register here). Proficient Latin for Liturgists. Students are presumed to have a familiarity with the forms of the subjunctive and an awareness of its uses. Students develop an appreciation of the Latin language through reading and understanding texts from the liturgy and prose on the liturgy from six areas of ecclesial literature: biblica, patristica, liturgica, scholastica, magisteria, musica. In this encounter with Latin literature of every age, students give particular attention to the sequence of tenses and usages of the subjunctive along with the use of indirect discourse, participles, gerunds and gerundives. This course is held daily during the summer programme and may be taken for post-graduate credit through KU Leuven or for audit (no credit) through the Institutum Liturgicum. Summer Programme, 2018. Classes are held daily from Monday 13 August for two weeks until Friday 24 August (not Saturday – Sunday 18 – 19 August). Enrol for the first week or for both weeks. Times vary for each course. 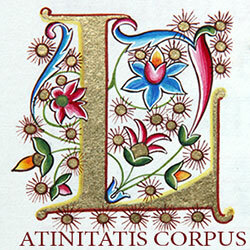 Cicero’s letters is an integrative and summative course that that may be taken alone or in conjunction with the course Proficient Latin for Liturgists. Each session is spent considering the Latin expression and English meaning of the letters of Cicero to family and friends. The course is conducted from a draft book Ossium Carnes Multae: The Bones’ Meats Abundant, in preparation by Reginald Foster and Daniel McCarthy, with the assistance of Daniel Vowles (more here). Latin for the Deaf is unique to our summer Latin programme. Beginning Latin for the d/Deaf is taught in sign by Greg Carrier (deaf, SEE) under the moderation of Daniel McCarthy (hearing, ASL), as is the first half of the Intermediate Latin for the d/Deaf. The second half of the intermediate course is taught in sign by Daniel McCarthy. The daily tutorial sessions are well tailored to meet the needs of the individual student. Much of the course is conducted in private study of the Ossa book with Ludi domestici, “home games” prepared by Reginald Foster himself (Beginning Latin for the d/Deaf – Intermediate Latin for the d/Deaf). Reginald Foster. 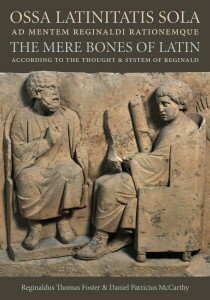 Our method of teaching the Latin language was developed by Fr Reginald Foster, former papal Latinist who tought Latin to many generations in Rome. Over fourty years of helping people to grow fast and solidly in the knowledge and use and appreciation of Latin has guided him in developing his method of teaching Latin (more here). Location of the Benedictine Institute on Google Map found here and given below. More information on travel to the Benedictine Institute by air, train or metro and on accommodation at or near Ealing Abbey is available on the web-site of the Liturgy Institute under the button: “Courses Summer 2018”. There you can also find the procedure for enrolling in non-credit courses at the Benedictine Institute (IL enquiry form and enrolment form here) and for enrolling in graduate credit courses accredited by KU Leuven and taught at the Benedictine Institute (KU Leuven enrolment information here).